The technology company Continental has significantly increased its financial flexibility with a successful fiscal 2015. “Continental is in great shape. With our proven business model, we generated free cash flow before acquisitions of €2.7 billion in 2015. We increased our equity to €13.2 billion, its highest level to date. This enables us to act tactically and powerfully in a challenging environment and to play a major role in shaping the digital future of mobility with our innovations,” said Continental Executive Board chairman Dr. Elmar Degenhart at the presentation of the preliminary figures for fiscal 2015 in Hanover on Thursday. “Backed by a strong financial position, we are tackling the major challenges ahead with Continental’s typical agility. These challenges particularly include volatile markets, fluctuations in raw material prices and currency exchange rates. In fiscal 2016, we expect to generate a similarly high level of organic profitable growth of around 5 percent, as in the past year. We want to take advantage of the opportunities arising from new, digital mobility concepts in a systematic and focused manner this year. In doing so, we will concentrate on developing our successful business model intelligently and tapping new business areas and customers in an innovative way,” said Degenhart. “The start we have made to this year in a difficult environment confirms our expectations for 2016,” he added. Continental CFO Wolfgang Schäfer stated that the technology company had comfortably achieved and in some cases significantly exceeded its annual targets in 2015: Sales climbed by more than €4.7 billion or around 14 percent to €39.2 billion. EBIT rose by 23.0 percent year-on-year to €4.1 billion in fiscal 2015. The EBIT margin came to 10.5 percent after 9.7 percent in 2014. Adjusted EBIT, particularly adjusted for changes in the scope of consolidation, acquisition-related amortization and special effects, increased by 15.3 percent year-on-year to €4.5 billion in 2015. This corresponds to 11.8 percent of adjusted sales after 11.2 percent in 2014. 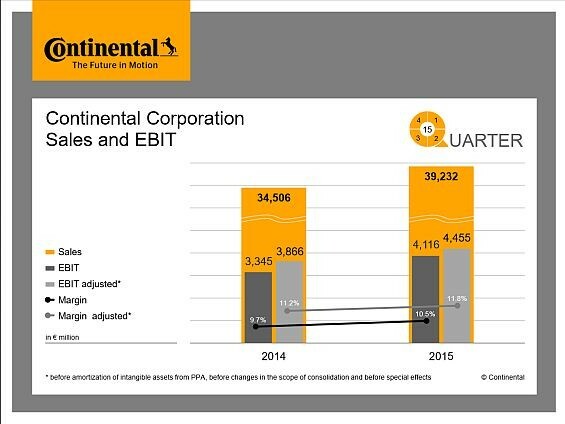 For the current fiscal year, Continental anticipates a growth rate similar to that achieved in 2015: “We expect organic growth of 5 percent to approximately €41 billion, which means we would again grow faster than the market with our innovative electronics, sensor and software solutions and our industrial products and tires. We also expect to comfortably achieve an adjusted EBIT margin of over 10.5 percent again,” Schäfer announced. “The 5 percent increase in organic sales is comparable with the rise of around 4 percent achieved in 2015. These figures do not take into account foreign exchange rate effects and sales contributions from acquisitions. These two effects increased sales by an additional 10 percentage points in 2015. The rise in sales thus amounted to 14 percent in total,” explained Schäfer. He added that Continental was anticipating only a moderate rise in global vehicle production of 1.5 percent to just under 90 million units. The weak development of the Russian and Brazilian markets was expected to be more than offset again by growth in the vehicle markets in Europe and China. Compared to the previous year, free cash flow before acquisitions posted a significant increase of more than €500 million to €2.7 billion. “Despite cash outflows for acquisitions totaling more than €1.2 billion, primarily for Veyance Technologies and Elektrobit Automotive, free cash flow after acquisitions amounted to €1.4 billion in 2015,” emphasized Schäfer. Compared to the end of 2014, net indebtedness was up slightly more than €700 million to €3.5 billion. The gearing ratio increased only slightly year-on-year to 26.8 percent (previous year: 25.6 percent). This was due primarily to the acquisitions of Veyance Technologies and Elektrobit Automotive. As at the end of 2015, Continental had liquidity reserves totaling €5.2 billion, consisting of cash and cash equivalents of €1.6 billion and committed, unutilized credit lines totaling €3.6 billion. This represented a decline in liquidity of €2.0 billion in comparison to the end of 2014. “This was chiefly due to the acquisitions of Veyance Technologies and Elektrobit Automotive, the early redemption of the U.S. dollar bond in mid-September, and the reduction of the syndicated loan from €1.5 billion to €350 million,” explained Schäfer. “This amount is more than sufficient for a company of Continental’s size and structure,” Schäfer added. Compared to the previous year, interest expense decreased by €19 million to €341 million. Net interest expense improved by €20 million year-on-year to €246 million in 2015. Income tax expense for fiscal 2015 amounted to €1.1 billion. The tax rate was 28.2 percent. In fiscal 2016, the tax rate is expected to be around 30 percent. Continental invested €2.2 billion in property, plant and equipment, and software in 2015. The capital expenditure ratio thus amounted to 5.6 percent after 5.9 percent in the previous year. Research and development expenses rose by 14.6 percent year-on-year to more than €2.4 billion, corresponding to 6.2 percent of sales, as in the previous year. The positive business performance also resulted in a growing number of employees: At the end of 2015, the technology company had approximately 208,000 employees, roughly 19,000 more than the year before. This increase was also due in particular to the acquisitions of Elektrobit Automotive and Veyance Technologies, as well as a rise in production.